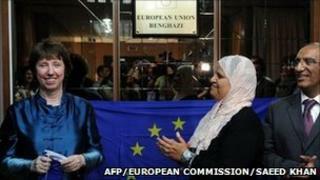 The European Union's foreign policy chief has opened an EU office in the rebel-held Libyan city of Benghazi. Catherine Ashton said the rebel Transitional National Council (TNC) represented the aspirations of Libyans and would receive support from the EU. Her visit is being seen as a boost for the TNC as it seeks recognition. It came after Nato warplanes carried out further attacks on government targets in Tripoli, including Col Muammar Gaddafi's compound. Opening the new EU mission in Benghazi, Baroness Ashton said: "We are here for the long term." She added: "What we can offer is support to Libyan institutions and the economy. We will be here to support you all the way." So far the TNC has been recognised as Libya's legitimate government by only a handful of countries, including France and Italy - although most EU countries support the Nato air campaign aimed at protecting civilians. Baroness Ashton said the EU regarded the council as "people with whom we have a strong dialogue". The head of the TNC, Mustafa Abdul Jalil, thanked "the European Union for supporting the revolution". In Tripoli, Col Gaddafi's government said opening an EU office in rebel-held territory was tantamount to the "recognition of an illegitimate entity". "This will have repercussions on Libya's rapport with several EU countries and institutions," a foreign ministry statement said. The rebels rose up against Col Gaddafi's 41-year rule in February, swiftly capturing Benghazi and other eastern cities. Col Gaddafi's forces remain entrenched in Tripoli and the west, despite the Nato campaign. The latest strike on Tripoli struck the port area and Col Gaddafi's sprawling Bab al-Aziziya compound.